Across the United States, increasing numbers of parents are refusing some or all vaccines on behalf of their children. This practice of vaccine refusal is commonplace enough that it is causing upward trends in preventable childhood infectious diseases such as measles and pertussis. In turn, gaps in mandatory childhood vaccination rules are becoming an increasingly prominent policy issue for public health officials and lawmakers. Since the first inoculations to protect against smallpox infection were administered in 1798, dozens of vaccines have been discovered and put into use, preventing untold of cases of infectious disease around the world. High levels of childhood vaccine coverage have been achieved in the U.S., mainly through state policies requiring specific vaccines for school enrollment. Since its widespread implementation, childhood vaccination became one of the greatest successes of public health policy. For example, in the United States during the 1940-50s, regular outbreaks of polio caused illness, permanent disability and death among thousands of children each year. But after the polio vaccine was developed in 1955, cases declined sharply and endemic polio was eradicated in the U.S. a quarter-century later. Vaccinations are responsible for similar dramatic stories among a host of other diseases, including some of the deadliest in human history: smallpox, diphtheria and measles. However, increasing numbers of parents are questioning the safety, efficacy and necessity of routine childhood immunizations. I discussed this trend in a Sept. 27, 2017 talk for the Wednesday Nite @ the Lab lecture series on the University of Wisconsin-Madison campus, which was recorded for Wisconsin Public Television's University Place. My presentation focused on the rate of vaccination among California school-aged children, as well as implications of these trends on epidemic disease and public policy. Parents who have concerns about vaccinating their children — which is known as vaccine hesitancy — cite a variety of reasons. Their motivations include religious conviction; fears about toxins in the vaccines and links to autism; and the idea that it is more effective or better for children to acquire immunity by getting infected by the disease itself. Data reported by schools in California show that there was a steady growth in the number of children who had an exemption from the mandatory vaccine rule since the beginning of the 21st century. The exemption rate grew from about 1.5 percent of all California kindergarteners in 2001 to over 4 percent in 2013. That 4 percent represents thousands of unvaccinated children. In addition, these children are typically clustered together in schools that have much higher rates of exemption than average. Vaccines are drugs that improve the immune system response to a virus or bacterium that causes illness. Vaccines often contain an agent that resembles the disease-causing microbe, and are often weakened or killed forms of the pathogen itself. Exposure stimulates the body's immune system and prepares it to quickly identify and destroy the infectious microbes when they are encountered later. Vaccinations are extremely effective in preventing infections. Childhood vaccines have eliminated or near-eliminated many diseases in the U.S., including diphtheria, haemophilus influenzae b (or Hib), measles, mumps, rubella, polio and pertussis. Other vaccines target pathogens that have not yet been eliminated, such as rotavirus, varicella, hepatitis A and B, human papillomavirus, pneumonia, shingles, influenza, meningitis, rabies and tetanus. More diseases are the focus of ongoing research to develop new vaccines. Vaccines work in two ways. First, they directly protect each person who gets vaccinated from the pathogens they target. However, some people cannot be vaccinated because they are too young, or they have allergies or compromised immune systems. Moreover, sometimes vaccines don’t work at the individual level. But when there is widespread vaccine coverage, an entire population is protected from an outbreak, including these individuals, by making it very unlikely for an epidemic to get started. This effect is called herd immunity, community immunity or population immunity. Herd immunity is a statistical phenomenon. It describes how likely an epidemic outbreak is based on the chances that an infected person will come into contact and infect another person who is susceptible. In order to prevent epidemics of a very contagious disease like measles, as much as 98 percent of the population must be vaccinated. Vaccination hesitancy among parents is linked to lower vaccination rates in children, as well as delayed vaccination schedules and selective vaccination. There is no link between autism and vaccines. The study that originally linked autism and vaccines was retracted after it was discovered that the author fabricated the data and results. However, the idea of such a link was very sticky, and in spite of there being no evidence to support it, there are still parents with concerns about a vaccines-autism connection. Every U.S. state requires children to be vaccinated in order to enroll in school, but in most states parents can get an exemption from this rule, in some cases very easily. That includes Wisconsin, where children are required to have a set of vaccines specific to their age and grade level to enroll in school. However, these requirements can be waived if there are medical, religious belief or personal convictions that conflict with vaccination. State-level policy has been the traditional method of ensuring widespread vaccine adoption. The effect of a 2013 policy change in California that made it slightly more difficult to obtain an exemption from the state's mandatory vaccine rule was modest, and did not address pockets of unvaccinated children in certain counties and schools. A 2015 policy change in California banned all voluntary exemptions, and this reduced the exemption rate to historic lows. Recent disease outbreaks in the United States have been directly linked to an increase in intentionally unvaccinated children. 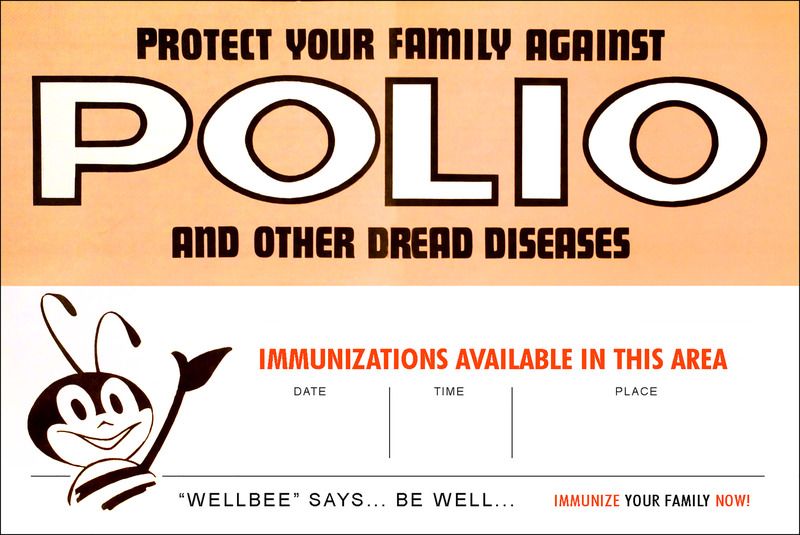 This 1963 poster featured what at that time, was Communicable Disease Center's national symbol of public health, the Wellbee, and included the date, time and location of where one could receive a vaccination for polio and other diseases. Since 2017, additional data have become available on the vaccine status of children in Wisconsin schools. In January 2019, the USA TODAY NETWORK-Wisconsin published a database of vaccination rates in public and private schools around the state, accompanying reports about exemptions and the reemergence of measles. These data should be interpreted with some caution, though. Some children who have a vaccine waiver on file may be partially or fully vaccinated. Although these children are much more likely to be missing at least some vaccines, in some cases parents may file a waiver because they don't have access to vaccine records or for other reasons. In addition, schools may have incomplete data on the children who are enrolled. Public health practitioners have much to learn about the reasons parents are increasingly hesitant about vaccines. My current research focuses on understanding the epidemic risk that stems from clusters of unvaccinated children, as well as the reasons these clusters arise.